National Donut Day comes around once a year. Read on to discover how to celebrate the sweetest day of the year by doing more than just eating lots of donuts. Though that would suffice, you can feed your creativity too. Use paint for the icing and colored rice for the sprinkles to make this adorable donut craft. Cut a hole in the paper plate, and you've got one delicious looking fake donut. Perfect craft for playtime! How cute would this ring toss game be for a little donut party? 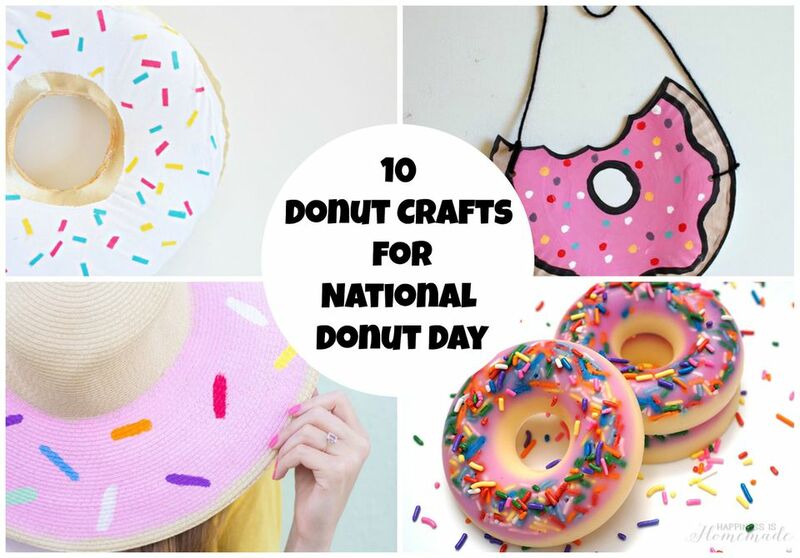 You'll love this easy and fun donut craft idea! Celebrate National Donut Day with this donut party garland. Make it and hang it in your home for some cute decor. Lather up in the shower with donut soap complete with sprinkles. It's scented too! You can make this donut soap in less than 10 minutes. DIY Donut Scented Soap from Happiness is Homemade. Take cover from the sun in your donut floppy hat! This is a fun project for the summer. You'll never forget the time with this donut clock hanging in your home. It's always time for a donut! Little girls will love crafting and wearing this donut plate purse. It's perfect for keeping donuts in for National Donut Day. Give your kiddos sewing practice with this donut pillow project. Soft, comforting, and super cute. You'll love this idea too! The possibilities are endless with this donut sprinkle game. Play this game with your kids on National Donut Day.